GTU CCC Exam Online Registration 2018: Gujarat Technological University, Ahmedabad has published a notification for the gtu ccc registration 2018 for Government Employees. Next Online Registration will open from the date 15/3/2018 to 21/3/2018. 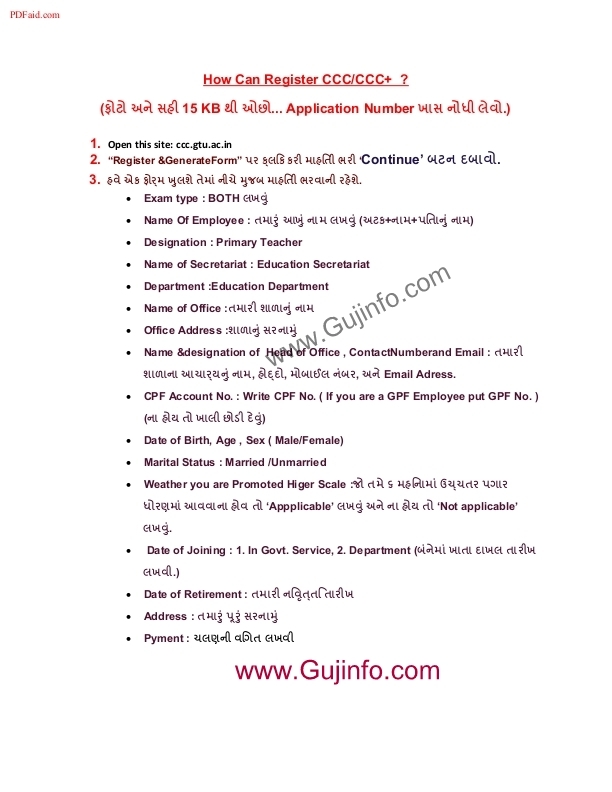 ccc.gtu.ac.in – Gujarat Technological University, Ahmedabad Invite Online Application Only for Government Employees. GTU CCC Exam Online Registration Start From 17 July 2014. All the Government Employees who are applied for this CCC/ CCC+ Exam can must visit official Website ccc.gtu.ac.in. After Online Apply For CCC submit print copy to the University office as per the following Instructions. Candidate Download Full Notification and Instructions from official Website. An applicant has to pay the fees of Rs. 200 for Theory & Practical both (or) Rs. 100 each for Theory and Practical in any SBI branch. An applicant can submit their application in GTU personally or send to GTU via Post/Courier referable to The Registrar, “Gujarat Technological University Nr. Vishwakarma Government Engineering College Nr. Visat Three Roads, Visat – Gandhinagar Highway Chandkheda, Ahmedabad – 382424 – Gujarat”. After GTU CCC Online Apply Gujarat Technological University inform about exam on mobile sms or e-mail. Candidate Read full details on this website. The Exam will be conduct in short time by University. Candidate are must required to apply online and submit your application at given address. Your submission must have Application Printout, with proper Attestation, Original Copy of Challan and Photo ID proof (Voter card/ Driving license/ PAN card/ Passport/ Adhar Card) any one. Any Problem or query you can contact on ccc@gtu.edu.in. Candidate advised to follow some step to CCC Registration as given below. Now Click on “Registration” button at the end of Instructions. Then Fill all information in the form and click on “save and generate” form button. Now Check your photo and Bar code then print the application form and challan. Gujarat Technological University, Ahmedabad GTU has announced CCC exam result which was held on June 2017. Candidates can download /view GTU CCC Candidates List and Hall Ticket From Below Link. online application ragestration mate demo apajo. registration close thai gyu 6, fari kyare chalu thase? Bhai mare ccc krvu che…. Hu student chu… To gtu mathi thyi sake?? …. Sir. Mare ccc aapvi se. Hve next kyare form bharase? sir, mare ccc ne exam apavi chae to next karya exam na form ane course ne fees kately chae may ambedaker open univercity ma thi ccc course karalo ama pass pan thayo to pan caletor cachare ma any sircity ficate manya ganta nathi atal matae mare farithi course karavo chace atla matate tame center nu list ane course ne fee anye next exam karya chaye anie tharikah ane ana form karaya bharavana chae ta mane janavaso kame kaye colater caharey tamaru cirty ficate manya ganes avu mare cahari ma thi janava malu chae. CHALAN KEVI RITE KATHVANU SE? and SBI Challan No. DU05349135 PAID AT SBI KALIYABID BRANCH CODE 60411. PLEASE GUIDE ME TO COMPLETE THE FORM. 200 kay rite bharva te janavajo? gtu ccc ni total fees ketli 6?? ane anya bank ma account hoy to ??? I have LOGIN ID as application number but password is not with me. I forgot my CCC exam registration application no. so I can’t edit my application form. so what’s the way out. please help me. my username & mobile no. is 9727863006.please reply as soon as possible. I want an admission for CCC examination as early as possible and I have this for conformation of my appointment order and I have to pass this CCC exam in 4 month so his can I do this. Please give me the further and exact information to take admission in Gtu. Please mail to “ccc@gtu.edu.in” regarding any application form query/problem…. I have filled Ccc phase2 form and I have already paid fees 200/- rupees from online. I have printed out the fees receipt. I have sent Ccc form, fee receipt and I’d proof to GTU. For That I have done process which is right, sir. when the next registration will be open. pl say me the next new registration date? Sir I gave ccc exam on 17 sep. My application nub. Is C14082065 i havn’t know my result so please. I can’t convert aspx file to pdf.I have android mob. give any idea or result. Application number is wrong please check ..
GTU CCC exam only government employer matej se ? Sir CCC registration ni website par instruction ni niche “Registration” button Kem hal dekhatu nthi.k pchhi registration chalu thay tyaare j dekhay ? 11.30 am pachhi fakt 2 ke 5 minute mate dekhashe. Maru ragistion Thai gau Che pan bhul thi father na Nam ma utaval thi d NI jagya a b lakhau Che to su karvanu? Ragistraion thayi gayu che pan app id no koi msg aavyo nathi login thava chu karvu plz ans me. Registration no video sen karva vinanti. have application no medvva su karvu teni mahiti aapo. Thanks, Mr. Tapan Patel for information about ccc. Me 18-12 -14 na form register karelu pan 23 -12-14 sushi edit application Karel nathi to have such karu…..please give me some information…. I also job in Gujarat SRP…. Sir, hu gsrtc ma condoter ma services karu chu. Mare gtu ma ccc these? Aama su lakhvanu, reply fast. sir hu late padyo chu have achi ni aagli tarikh….? RESULT sixth nu malse marksheet malse ke? Aa month ma ccc nu registration thavanu chhe? Ane thavanu hoy to kyare thase? PLE. INFROM NEXT CCC REGISTRATION. i thashe?please inform me.Thank you. ccc ni exam ma je starting ma registration karvanu aave che tema pela mo no pachi name ane higher scale & promotion lakhelu aave che me tema higher scale per tic karyu to pachi ema kaik date lakhvani hati higher scale before jevi to te sena mate hati te janavso plz . ame phase 6 ma ccc nu form bharel hatu pan exam api shakya na hata have mare phari form bharvu chhe pan user already exist use new mobile no. for new registration or login avo massege ave chhe to phone no badalva chhata registration thatu nathi to amare shu karvu padshe te janavsho, please! I CANT SUBMIT MY CCC APPLICATION FORM PLEASE TELL ME HOW CAN I SUBMIT .I cant show my registration number. application no. C1508000400. could not upload photo. it says Please read instruction and try to upload photo again. photo size is 56 kb. please reply fast. Mara ccc na online registration form ni print ma details display thati nthi.. Ane online pn details dekhati nthi.. To mare su krvu.? To application accept thayi chhe k nai ? sir,,mare ccc ni exam aapvi 6e….form kyarthi bharase???? Sir, Mare CCC ni exam aapvi chhe. Maro Mobile No: 9714040683 chhe. Plz mane inform kro form kyarthi start thase? Thank you in advance. I am not government employee but I am a school teacher and my school is government granted, may I also apply ? There is not any special data in application form. Mare GTU ma ccc nu form bhari gayu n final form generate Thai gayu 6. Mare form ma sign cyber cafe vara e bija ni sign scan Kari didhi..to have mare form ma sign change karvi hoy to Kai rite karay?? April 20 to April 26 sudi na Ccc ni exam na form Bharaya 6e eni exam kyare levase? Bhai hu government employee chhu. Registration close thai gyu chhe. Have kyare khulse?